New York was once the Hop King. For 100 years between roughly 1810 and 1910 hops were grown in Central New York State in small plots on family farms. As breweries grew in the US, New York State became the primary supplier of hops in North America. 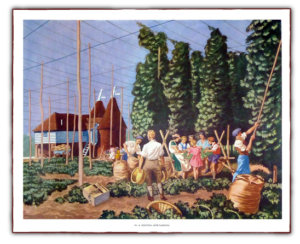 Production peaked in the late 1800’s and in 1880 the production was over 20 million pounds which is remarkable considering the farming practices of the day and that hops were all hand-picked. The numbers are impressive even by today’s standards. Today 20 million pounds of hops would provide the annual needs of the three largest domestic craft brewers – Sam Adams, Sierra Nevada and New Belgium….. 5 times over!!! In a rapidly growing movement hops are coming back to New York. We have been part of this, growing hops for 6 years at our home on Ringwood Road. We started with 75 rhizomes and divided the roots when the hops were transplanted. We have become active in the North East Hops Alliance (NEHA) which provides technical advice and group purchasing power to hop growers in NY, MA, VT and MD. Randy is a founding board member of NEHA. We are excited about the return of hop growing and love to share hop experiences with others. In 2011 we purchased 35 acres of open land to expand our hop fields. The land will be conditioned in 2012 with hopyards planted in the spring of 2013. We anticipate a yard of 4 acres (4000 hills) of hops of various varieties. Our farm will be operated organically though we are unsure of NOFA certification. Since we only need a portion of our land for hops initially we are working with local farmers who will use some for vegetables, berries and field crops. In time we will grow berries and fruit to use in our beers as well as demonstration plots of brewing grains. It should be interesting to watch the farm develop over the next few years as we increase plantings and try some new crops. For now we have more ideas than we have time.